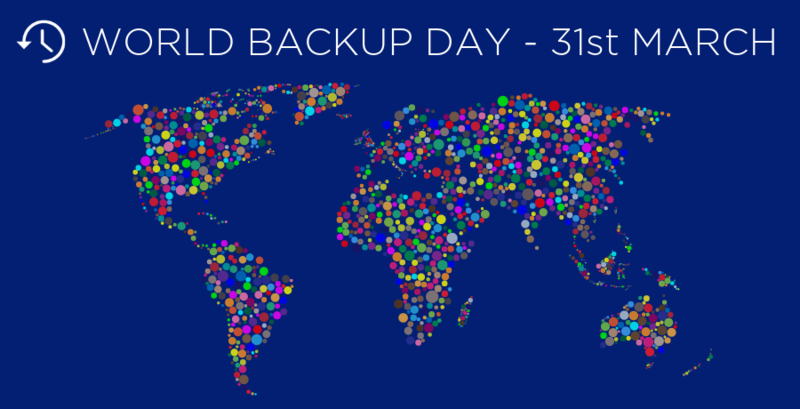 World Backup Day, 31st March - Why mark the occasion? World Backup Day was established in 2011 by university student Ismail Jadun and takes place on 31st March. It was initially founded to create awareness to encourage people to backup personal data such as photos, videos, documents and emails to a secondary place be that a USB stick, another hard drive or more recently to the cloud. The chosen date is no coincidence. The idea of selecting 31st March is to stop you putting backup off until another day, therefore preventing you from becoming an April Fool of your own making. 8 years on from conception, World Backup Day also serves as an important reminder of the increasingly significant role that data now plays in our lives, and not just on a personal level. For businesses large and small, it is key to re-examine existing backup solutions, not only to continue to protect against accidental losses, power outages and natural disasters, but also against the ever increasing threat from cyberattacks. According to Cisco’s 2017 annual cybersecurity report, Ransomware attacks are growing more than 350% every year. Cost effectiveness of current solutions. Resilience against Malware and Ransomware. Recovery speeds the event of a disaster. The impacts on business if recovery time objectives are not met. The infrastructure needed for business continuity. As businesses go through digital transformation, it is also important for IT departments to consider solution efficiency to free up more time for innovation and product development. Will you be celebrating World Backup Day, or will you end up an April fool? This entry was posted in Backup, Data Protection, Data Security, Disaster Recovery, Ransomware and tagged Backup, cybersecurity, Data Management, Data Protection, data security, disaster recovery, Ransomware.